BEIJING — A former rising star in Chinese politics has been charged with bribery, becoming the highest-level serving official to be prosecuted in President Xi Jinping's sweeping anti-corruption campaign, now in its sixth year. 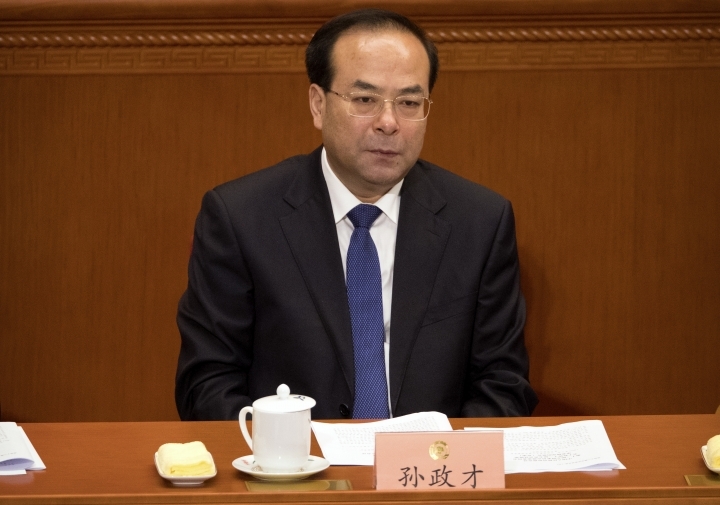 The Supreme People's Procuratorate announced the indictment of Sun Zhengcai, the former Communist Party leader of the western megacity of Chongqing and a member of the party's 25-member Politburo, on its website Tuesday. The announcement said Sun "illegally accepted huge amounts of money and goods" from others in return for providing them with benefits. Also Tuesday, the party's anti-corruption watchdog body announced the country's former top internet regulator and censor has been dismissed from his remaining post and expelled from the Communist Party amid accusations of corruption and violating party discipline. Lu Wei's former responsibilities included holding high-profile meetings with top executives from foreign technology and internet companies, including Apple chief executive Tim Cook, Microsoft's Satya Nadella, and Facebook founder Mark Zuckerberg. Among a long list of accusations against Lu was that he engaged in factionalism and "selectively enforced" the party's "strategic arrangements on internet work," in addition to being corrupt and abusing his powers. It said his case would be referred to "the relevant national bodies to be dealt with according to law." In the case against Sun, the indictment focused on bribery, but leaders have made it clear his alleged offenses were largely political in nature. The chairman of China's securities regulator said at a major party meeting last year that Sun and other senior figures prosecuted in the crackdown were "conspiring openly to usurp party leadership." Sun was expelled from the party and dismissed from public office in September because he was suspected of "serious discipline violations," a phrase that usually refers to bribery and other graft. Sun, 53, had been seen as a candidate for promotion to the Politburo's Standing Committee, the select group of leaders who constitute the apex of political power in China. He was removed suddenly from his Chongqing post and replaced by protege Chen Min'er, who was subsequently promoted to the Politburo. Sun had been identified most closely with the China Youth League faction associated with Xi's predecessor, Hu Jintao, which Xi has effectively sidelined in the succession process. Lu had been placed under investigation in November on suspicion of "serious violations of discipline." He had already been replaced as internet czar in June but until Tuesday had formally retained his position as vice minister of propaganda. Lu had been known as a hard-liner responsible for leading the government's efforts to tighten control over domestic cyberspace and championing the party's position that governments have a right to filter and censor their countries' internet. China has long sought to utilize the web for commercial purposes, while preventing the free exchange of information. Lu wielded wide-ranging powers over what China's 700 million internet users could view online and acted as gatekeeper for technology companies wishing to do business in China. He demanded tough security checks on imported foreign tech products and enforced measures to restrict the activities of foreign internet companies and block social networks like Facebook, Twitter and YouTube in the name of preserving social stability. Lu's departure has not led to any easing of such demands or restrictions on information.